So that's a nice saving even at the RRP and a lovely saving when you get it for £9.99 (£1.67 per tube). Yellows: PY3 = Hansa Yellow 10G; PY42 = Yellow Iron Oxide; PY65 = Hansa Yellow 65; PY74 = Arylide Yellow 5GX; PY138 = Quinophthalone Yellow. Reds: PR101 = Synthetic Iron Oxide Red; PR169 = Rhodamine; PR170 = Naphthol Red AS. Blues: PB15 = Phthalocyanine Blue; PB29 = Ultramarine Blue. Greens: PG7 = Phthalocyanine Green BS. Blacks: PBk9 = Bone Black. Last night I was a little bored, so I took out my gouache palette and made a colourchart on a sheet from a block of Langton Prestige 14 × 10" cold pressed 100% cotton watercolour paper . I enjoyed mixing the colours and painting (fairly) neat squares. I don't do a full grid, since they're reflective (in that every mix appears twice), so I just paint a triangle. I also added a set of levels using the white and black and a tint of each colour, using the white. 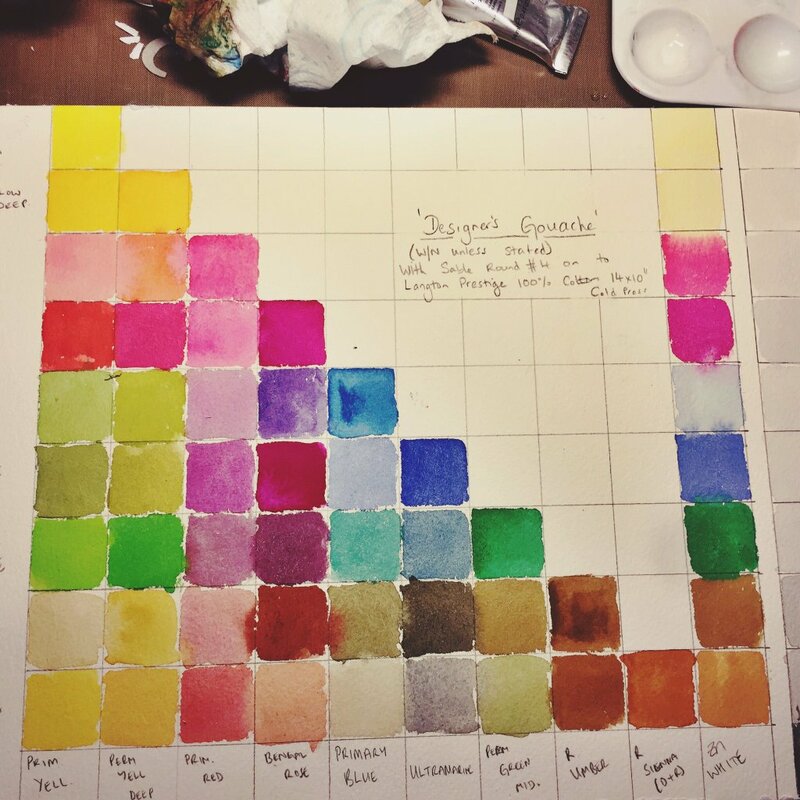 The colours from top to bottom (and left to right) are Primary Yellow, Permanent Yellow Deep, Primary Red, Bengal Rose, Primary Blue, Ultramarine, Permanent Green Middle, Raw Umber and Raw Sienna. The actual single colours without mixing are rightmost on each row of colours - on the "steps" of the triangle. The column of colours to the right are tints and you can just see the levels on the edge to the right. I really enjoyed putting this together, but as always, the blocked paper buckled a bit. I painted it using a Number 4 Sable. I am really looking forward to using my gouaches a bit more often now that I know the range of beautiful purples and greens they produce - absolutely perfect for botanical paintings!